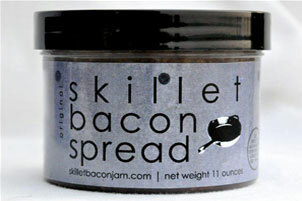 we make this bacon spread condiment called bacon jam..you say what?.. that’s right, we use niman ranch bacon and render it down along with onions, balsamic and other spices . It cooks for several hours until it is a perfect blend of smoky, tangy, savory and slightly sweet….basically spreadable bacony goodness! USDA approved. I thought when i opened it that it looked really gross. However when i tasted it i ithoguht it was awesome! We had made biscuits and gravy the day before and i added a spoon full of the bacon jam to it and mixed it up and it gave it the perfect bacon flavoring. This is really nice and i reccomend it to any bacon lovers out there. I received one or more of the products mentioned above for free using "http://www.tomoson.com Regardless, I only recommend products or services I use personally and believe will be good for my readers.